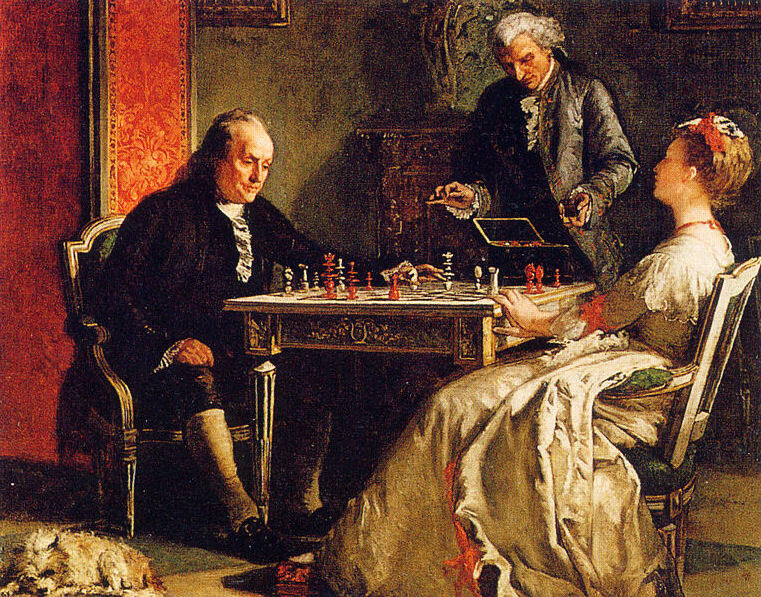 Lady Howe Checkmating Benjamin Franklin, 1867, oil on canvas by British American artist Edward Harrison May (1824–1887). Image courtesy Wikimedia Commons. It began with a game of chess. In December 1774 Benjamin Franklin met Caroline Howe at the Royal Society in London. She challenged him to a game, which turned into a series of chess matches over several days. On Christmas Day, she introduced the American to her brother, Lord Richard Howe, who told Franklin that some members of the British government “were extremely well disposed to any reasonable accommodation” between the British and the American colonists. The two men continued to use the chess matches as a front for a series of secret meetings to negotiate a peace. Nothing concrete resulted from the meetings, which ended in March 1775, but the Franklin and Howe concluded their talks with a mutual respect for one another. The following year the admiral was appointed commander of the British navy in North America. Historian Walter Isaacson summarizes what happened just after the Continental Congress issued its Declaration of Independence. [Admiral Howe] carried a detailed proposal that offered a truce, pardons for the rebel leaders (with John Adams secretly exempted) and rewards for any American who helped restore peace. Congress granted Franklin permission to reply, which he did on July 30. If you don't see the full story below, click here (PDF) or click here (Google Docs) to read it—free! What an insightful piece of Americana--the developing tension about the colonists trading tea with other countries instead of with the British (an oversimplification). The British spelling and the capricious capitalization were also fun to notice. Benjamin Franklin was a talented writer. I am uncertain why the British were willing to parole all the members of the US Congress -- except John Adams. What did Adams do that made King George so angry?